Yesterday was my awesome Moms Birthday, and she requested her all time favorite cake, German Chocolate!So I thought, why go spend the money on having one made, when I know I can make a better one myself! So I decided to make this German Chocolate Cupcakes Recipe! It’s perfectly sweet, and perfectly easy to make! 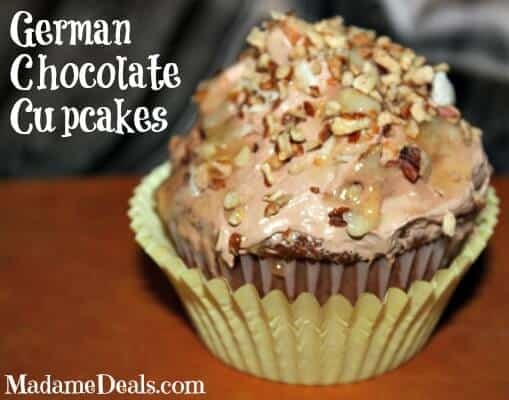 In my opinion, this homemade German Chocolate Cupcakes Recipe tastes better than any store bought cake I’ve ever had! First, line a cupcake pan with cupcake liners and set your oven to 350 degrees. Coarsely chop your chocolate and add it and your water to a small sauce pan. Melt chocolate over med/high heat. When melted remove from heat and let cool. In a medium bowl, sift together your flour, sugar, salt, baking soda until well mixed. In another bowl add you eggs, chocolate and vanilla, beat until well mixed. Add you wet ingredients in with your dry and beat on low until well mixed. Pour your batter into your cupcake liners and bake on 350 degrees for 18-23 mins. While your cupcakes are cooling, in a small saucepan add in your sugar, condensed milk and egg, turn your heat up to medium/high and stir your mixture for 5-8 mins or until it becomes thick. Set aside to cool. Toast your coconut flakes and pecans, and add them to your cooled glaze. 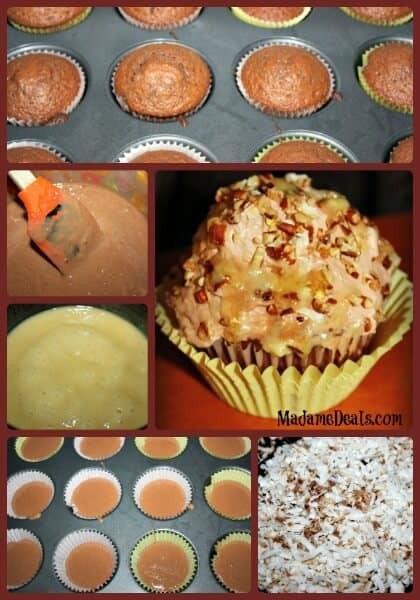 Frost your cupcakes, and add your glaze on top, sprinkle with a little extra coconut and serve! This German Chocolate Cupcakes Recipe was a huge hit for my Moms birthday! The adults and kids both loved them, and I think they will have to be a yearly thing now ha! This was my first time using the Cool Whip frosting and it was a-maze-ing. I highly recommend it! What are some of your favorite homemade cake recipes? Share them in the comments below!